Battle of the Pucks is up on Google Play! What do you get if you crossbreed air hockey, shuttleboard, curling, pool, pinball... and even checkers? That's right: Battle of the Pucks! It is an exciting little game with a very simple goal: propel your pucks so they ram your opponent's pucks out of the field. And whenever you score (drive off their puck(s) but don't lose any of your own), you get to push again! GO GO GO! Version 4.0 was released on November 10, 2018. It has nicer (and faster) visual effects and two more levels with 20 entirely new boards with mazes of obstacles. Get the game on your phone or tablet, play it, and leave your rating/review on the Google Play page! We would hugely appreciate if you also let us know directly on Twitter or by email. Here's our official press release and press kit. The goal of the game is to shove one of your pieces so as to drive the enemy's pieces off the board without losing any of yours. Despite the game's simplicity—and addictiveness!—it takes time to master the skill of propelling your pucks with the exact required force and direction. More than that, it takes strategy and foresight to not only score but create positions that are of maximum difficulty for your opponent. You can play against the computer's AI (Artificial Intelligence). It is, by default, intelligent enough to sense how well you play and adapt its own foresight and precision accordingly (Adaptive AI) so it's never boringly silly or prohibitively strong but just right for you. You can, however, also set it to a fixed strength (Easy, Medium, Strong, Insane) by going into the Options (use the menu at bottom). You can play against another human being — on the same device (network play is planned for a future version). Just push your pieces in turns and see who wins! The game enforces the rules (i.e., won't let you push when it's your opponent's move). Or, you can watch two AIs (one is usually slightly stronger than the other) battle each other — endlessly! Admire their sheer power, peek into the yet-unlocked levels, and learn new techniques! Currently the game has 100 play boards, divided into 10 levels, 10 boards per level. Initially you can only play the first level, but when you finish it AND your play strength is high enough, level 2 gets unlocked so you can continue. You can restart new game from any unlocked level, not just level 1. 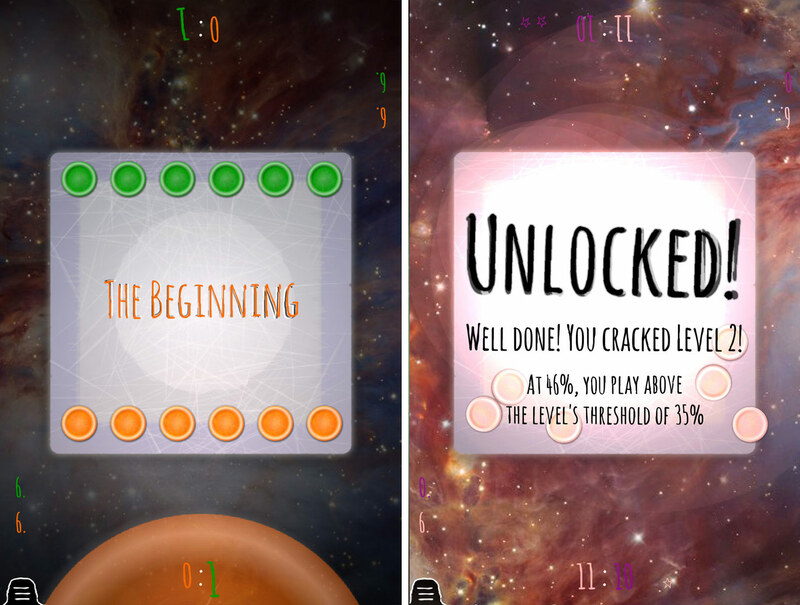 The level-choice screen lists all locked and unlocked levels — track your progress! 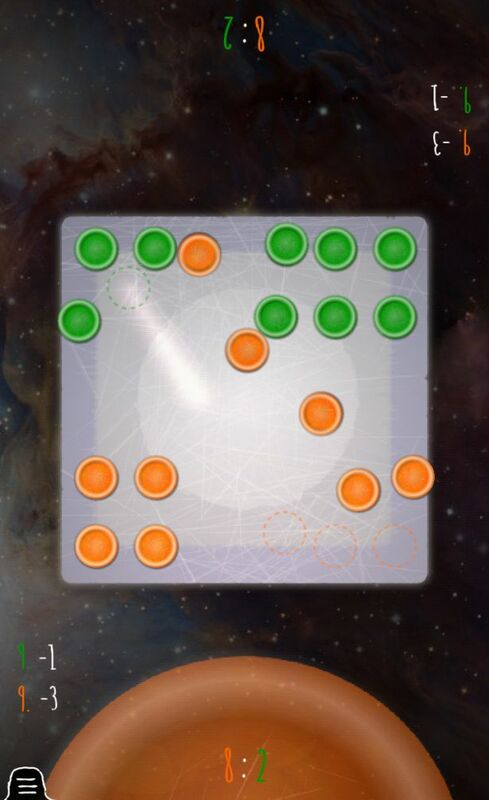 Subsequent levels are progressively more difficult to unlock, and their boards become more difficult too: the layout of the pieces and shape of the board make the play more challenging. As you ascend in your gameplay mastery, you will unlock advanced levels where the playing board can be non-rectangular (even non-convex! ), and the pucks are of different sizes/weights with varying friction — so you'll have to come up with new strategies and new ways to play. 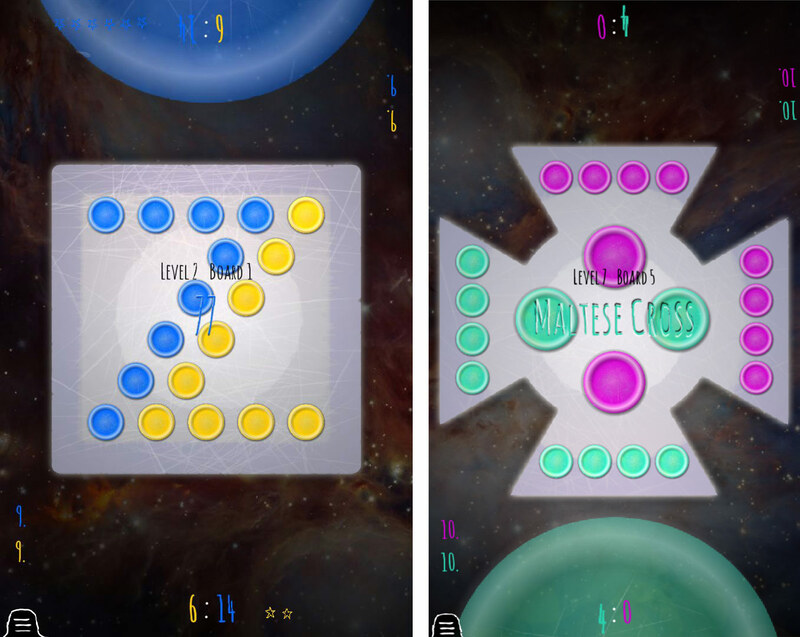 Level 8 introduces a new element into the game: obstacles. Barriers, borders, walls, pegs... think pinball. Pucks of all sizes fight for survival in artfully constructed mazes, from addictively simple smash-it-alls to seemingly impossible standoffs, bottlenecks, and cliffhangers! See if you can hit the exact walls at exact angles to sweep away the enemy pucks. The game not only keeps an eye on how well you play: it records it for your review. 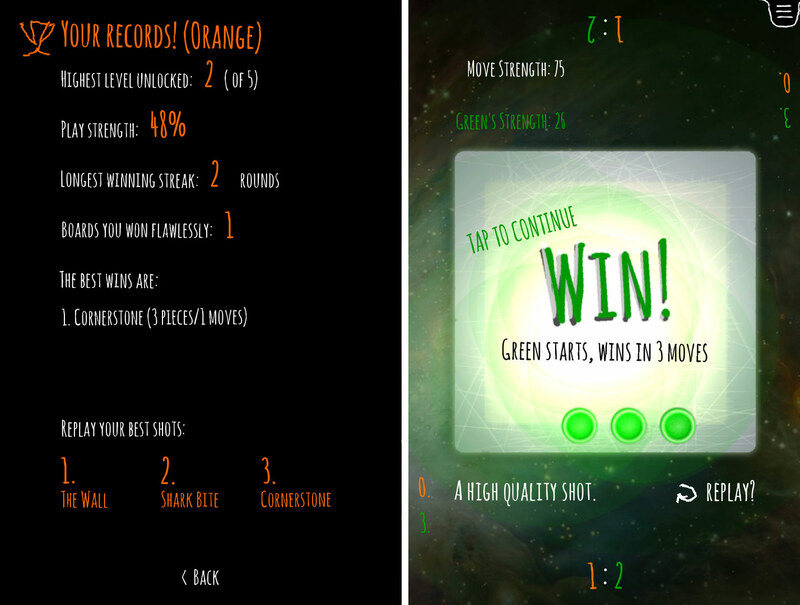 On the Records page (use the menu at bottom), you can always check your highest unlocked level, your current play strength, the number of boards you won with a star (that is, without losing a piece and without even giving your opponent a single move) and other fun stats about your gameplay. You can also replay the three best shots you have ever fired — make your friends admire your most crushing, most precise, and most against-all-odds shots! 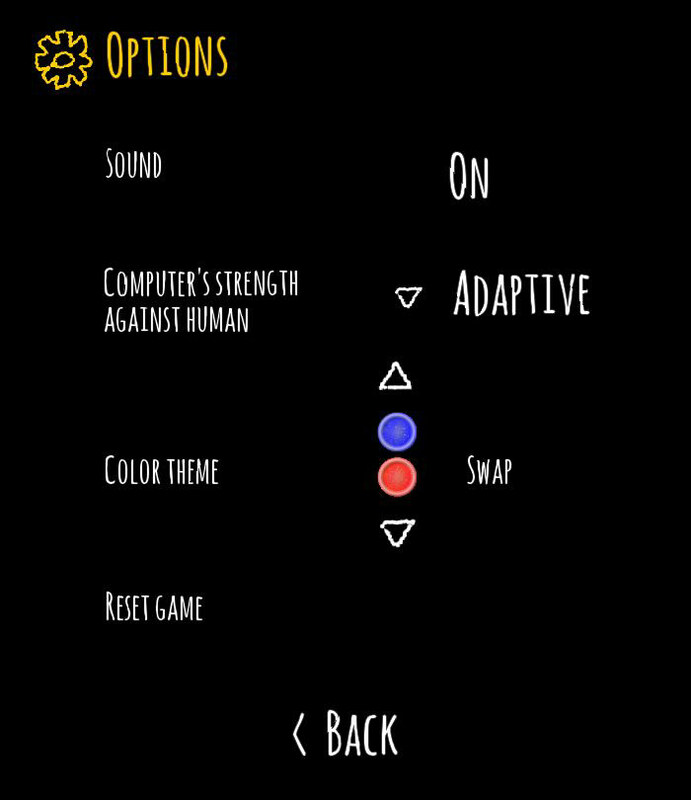 Finally, in Options you can choose one of the several color schemes, set the level of difficulty for the AI opponent (adaptive or of a fixed strength), and enable/disable the sound. Here's a sampling of how the gameplay on Level 7 looks like. Watch in awe how two AIs are battling each other at their full strength... but still making errors, of course, because there may no longer exist a straightforward winning strategy for some of these boards, so the outcome often depends on chance. "A huge condom looking above a match of Connect Four. Wait, what?..." "First of all, I have to praise the visuals: The chabby-chic doodle chalkboard style of the start screen, the scores, and the comments looks great and does match the scratched used-look of the game board and the pucks." "Lifemakers did everything wrong by creating the right atmosphere for the game, but they did everything right by making this game fun to play. It's simply enjoyable to fight for the last puck standing. The game is a perfectly designed mobile game with intuitive controls and one of these simple, yet genius game ideas all successful mobile games are made of." "Back in 2011, my former boss told me to discover hidden pearls, indie games, that are yet unknown but have the potential to become top sellers. I guess I've found one today. With a bit of polish, mostly regarding graphics and sounds, this game has a true potential to rock the Google Play charts." Lifemakers is a small, family-based indie game studio in Canada. Our philosophy is simple: the best games are those that are exciting but simple, overwhelming but nuanced, and at times bewildering — just like life. Check our other game, Batonic: A Game of Balance, released in June 2016.